June 20th is National Ice Cream Soda day, and what better way to celebrate it than to make an ice cream soda yourself? Here’s our recipe for an extra chocolatey old-fashioned ice cream soda that’ll be sure to make you feel nostalgic! Serves two 16 ounce portions, to share between you and a friend! 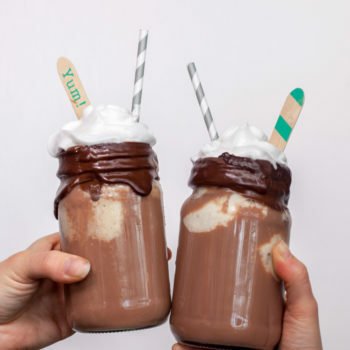 1) Take out two tall glasses (or a nice mason jar) and pour ¼ cup of chocolate milk in each glass. 2) Add 3 tablespoons of chocolate syrup per glass, and stir thoroughly. 3) Add a cup of seltzer water to each glass, stir, then add 2 scoops of chocolate ice cream. 4)Top with whipped cream, chocolate sprinkles, and maraschino cherries. Drizzle more chocolate syrup on top if desired.